A peaceful and private retreat for your family! Our charming cottage with front porch and back patio is on a 1.5acre lot shaded by tall trees with easy access to a private community dock and bbq/picnic area with a boat ramp (*This is NOT a waterfront property. The community dock is 400yds away from house, which is a 5min walk, and is privately accessible to the homes in our small subdivision). Located in Pigeon Run cove across from the Lake Anna State Park - a bit quieter with much less boat traffic. Tranquil waters for your early morning coffee and fishing, and then plenty of fun and activity in the afternoon. We have inflatable rafts, outdoor and board games, and a portable hammock for your enjoyment. In the evenings, light up our fire pit and grill and relax on the back patio into the night! 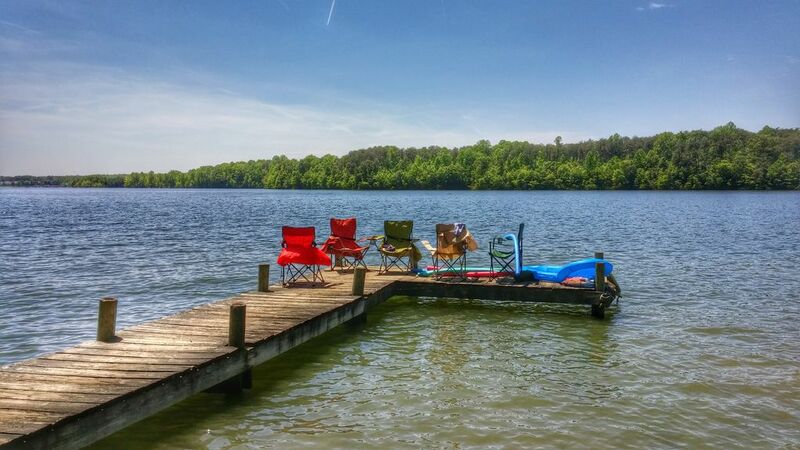 Minutes to Lake Anna Winery, Anna Point Marina, and plenty of restaurants and markets. Before booking, please inquire first about groups larger than 4, dates less than a week out, and discounted rates for longer term bookings. 1. You understand this is not a waterfront property. 2. You have read through the rental and house rules document attached to the listing. 3. You agree to send in a signed contract no later than 30 days before check-in. This reservation will only be finalized after receipt of the signed contract in addition to the payment. We will send you the property address upon receipt of signed contract. The stay was great. We had everything we needed and the proximity to the water and boat ramp was fantastic. Will definitely be back. Great, peaceful spot- beautiful in the Fall! Owners were very easy to get a hold of. The cabin and the property were clean and everything was in good shape, although the bed in “master” was a little uncomfortable. Basic kitchen utensils were provided and it was actually nice not to have television. Nice walk to the lake and dock. Will come back! I was very diappointed with the rental and we did not stay. I was very diappointed with the rental and left after only 30 minutes due to many reasons. Our original stay date was rescheduled due to Hirricane Florence, I guess we should have cancelled back then. If a full refund was not offered at least a partial refund should have been offered. Neither was granted so this will be our first and last time we use VRBO. Sade because we were really looking forward to our stay. Lessons learned the hard way. The House is very neat and clean in a nice and quiet comunity. The lake is few minutes away by walk and was so warm that you could be there hours enjoying swimming. We were cooking so there was a little lack of pots and pans. There is no tv so you can hear the nature around. Excelent getaway. The property was great and very clean!!! Great location and close to anything and everything you could want to do!! I definitely recommend this rental as a great get away weekend.